In a move absolutely everyone was expecting, Mercedes-Benz has revealed the CLA 35, the entry-level AMG version of its CLA Coupe. It follows the A35, the cheapest way into the Affalterbach club until now, and shares the same powertrain as the hatch; it borrows most of the styling, too. You can guess what the CLA 35 looks like from its name alone – and if you were forced to sketch the car without seeing it, you’d probably get pretty close. To all intents and purposes, this is a stretched A-Cclass, and specifically a stretched A35. That means it’s basically a standard CLA, with all the AMG aero furniture, firepower and jewellery stuck on. Wide wheelarches, twin powerdomes on the bonnet? Check. Double-louvre grille with extra trim dotted around the car? Present and correct. Spoiler and large diffuser flanked by beefy exhausts? Standard. Still, it’s almost identical to the A35 underneath. So the CLA 35 uses the same 2.0-litre four-cylinder powerplant with forced induction, and slips out 302bhp and 295lb ft of torque through Benz’s 4Matic four-wheel drive system. It’ll be mounted to a seven-cog twin-clutch automatic transmission only; no manual gearbox will be offered here. With a 0-62mph time of 4.9 seconds, the CLA 35 is 0.2 slower than the hatchback, thanks to its extra weight. Like the A35, the CLA 35 features no EQ Hybrid power – CAR understands that’ll be saved for the even more powerful AMG A45 hatch, and the CLA 45 that’ll inevitably follow suit. ... And the greasy bits? Engine aside, the CLA 35 features the same tech to improve handling as its hatchback sibling. A shear panel bolted to the underside of the engine increases chassis rigidity, and a McPherson strut suspension configuration is also used up front, too. At the rear, the CLA 35 uses a four-link rear axle with three transverse arms and a trailing arm to keep the wheels upright and in full contact with the tarmac, no matter the conditions underfoot. Three-mode adaptive damping keeps the ride tailor-made, while 350mm discs coupled with four-piston monoblock callipers at the front, and 330mm discs coupled with single-piston sliding callipers at the the rear will stop the CLA. Steering is taken care of by a speed-sensitive, electro-mechanical system, just like on the A35. Like the A35, this car will feature multiple handling personalities, Mercedes-Benz promimses. Drivers will be able to choose from Slippery, Comfort, Sport, Sport+ and Individual modes. What about the CLA 35 interior? Jump in, and the CLA 35 looks like a night club, frankly. As you’d expect it's enhanced with the voice and swipe-operated MBUX infotainment system, but the Coupe also benefits from Mercedes’ 64-colour ambient lighting system. When combined with the CLA’s Artico man-made leather and Dinamica microfibre, it’s all a bit cocktail lounge or achingly cool, depending on your perspective. Still, the presence of MBUX is no bad thing – as we’ve found through many miles in the new A-Class – and in the CLA 35, you’ll get some special AMG-only options, too. You’re able to pick between Classic, Sport and Supersport but it’s the latter you’ll want to stick it on when doing any spirited driving. Select it, and the cockpit dials will be replaced with a Tron-like single rev counter, flanked with all manner of read-outs. Cool to the point of distraction. Talking of distraction, there’s no mention of head-up displays. 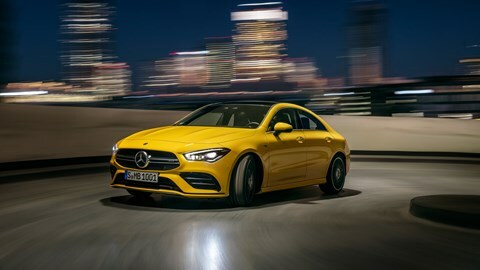 We'll update this article when we know more about the AMG CLA 35 including pricing and much more.